Today’s podcast is part 2 of my Services That Sell premium course that has taught countless individuals how to hit a four-figure monthly income. If you’ve successfully followed part 1, then you’ll already know what specific problem you’re going to sell. Now it’s important to determine what’s the most profitable way to package your offer and deliver your service. While I’m going to outline three options, you’ll also want to decide which one is most suitable for your business idea and how to go about providing a premium experience for your clients. It’s about working smarter, not harder. You can expand your product offerings in the future after you’ve laid a solid foundation. However, in the first twelve months, concentrate your efforts on one thing at a time. And remember, you don’t have to wait until you have a large audience before you start selling. Just determine where you’re at and choose the best of the three delivery methods to use. If you’re ready to go deep into the 3 types of services you can sell then listen to the podcast on iTunes today. I also strongly urge you to subscribe so you don’t miss any of this free content that could help turn your business (and life) around. – Digital courses – In order to offer a digital course, you need to be clear on the problem you’re solving, and have a well-documented process that can be replicated by someone else. It’s ideal for businesses that are already established in the marketplace, with a relatively large audience to sell to. – Group programs – If you don’t yet have a large audience then group programs could be ideal. You do need to be clear on the problem you’re solving and have a well-documented process. 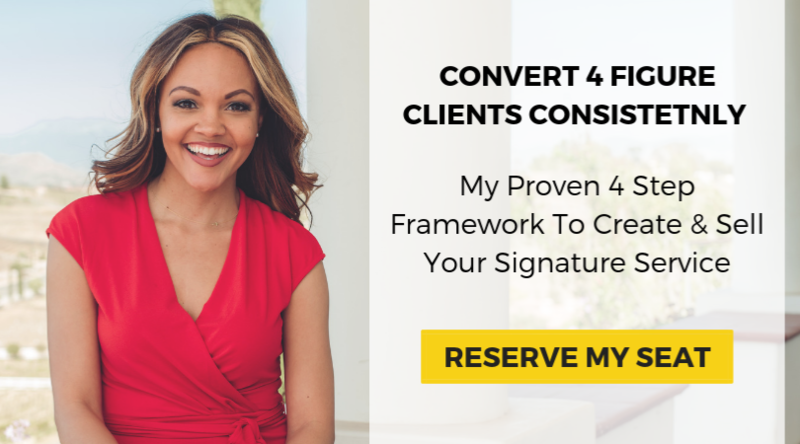 Selling this way enables you to really refine your methods and solidify your process. – One on one offers – If you don’t have much of a social media presence and you haven’t yet documented your process, then one on one offers are a great place to start. You can earn while you learn and build your confidence at the same time. – A recipe for disaster – Don’t try to sell all three at the same time. While it may seem like a good idea, it’s a recipe for disaster. Focus on one thing at a time. – Ramp things up – If you want to hit a certain income for the year then don’t divide by 12 to work out your monthly income. In reality, things don’t work that way. Instead, for each quarter (four months), you’ll need to spend a month on packaging and selling your service. The other three months are then for working with clients.